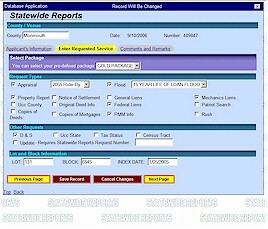 What is Statewide Reports Web Application? How can I access my data from the Web? Can someone else or anyone access my data? How long is my data available for me? What format is the data posted and transmitted? Why can't I use "PRINT TARGET" on a PDF File? Why does the Web App log me off after awhile? Can more than one user be logged on at one time? Do I need a special program to run the Web App? Can I download all the data and the program to run on my machine? How secure is the data posted? Can I submit a NEW REQUEST from the Web Application? When I start the Web App, I do not have my normal menu bar, etc? How does the Web Application Execute? What are the Network and Client Requirements? What are the Security Levels to access the data? What database is being used? To submit a question to Statewide Reports, please click here. Q: What is Statewide Reports Web Application? A: Statewide Reports, Inc. had this web application developed for easy assess to your data over the Internet. Searcher, Appraisers and Clients (Banks) can receive their request data at any time and from any computer with internet access available. Q: How can I access my data from the Web? A: If you are a Searcher, Appraiser or Client (Bank), you can access your requested data after Statewide Reports gives you Access Rights, a case sensitive User Name and Password. Clients are required to enter an ID Number as well. If you do not have the above, you will not be able to receive any data from the web app at all. If you are a user with access rights, you would first start the program from this website. Click on the link "LOGON SCREEN" and enter your information. If you are accepted you can then click on the associated link of your classification. APPRAISERS would click on "APPRAISER", SEARCHERS would click on "SEARCHERS" and CLIENTS (Banks) would click on "CLIENTS". Summary reports are available for Searchers and Appraisers. Q: Can someone else or anyone access my data? A: (NO) If you logon as an Appraiser then you will have access only to the APPRAISER section of the program and only have access to your data. No other data will be available to you. Q: How long is my data available for me? A: Currently Statewide Reports has set the web posting to be remove automatically after seven days of the posting. If you wish to have a request re-posted, you may submit a request to Statewide for the data and they can re-post it for you. Q: What format is the data posted and transmitted? If you wish a different type of file format, you need to contact Statewide Reports. Q: Why can't I use "PRINT TARGET" on a PDF File? A: A PDF (Portable Document Format) can only be opened and printed by a PDF Reader. The right-click menu option "PRINT TARGET" will not open a PDF reader and print it but will try to print the file through your browser. Your browser can not read a PDF File. To print the file, left click on the link and open the PDF. You can then print the document. Q: Why does the Web App log me off after awhile? A: If you have Logged On and you do not use any of the options available to you or if there is no activity for 20 minutes, the Web App will automatically log you off and shut down. You will have to restart the program and log back on to access your data. This time out is set for 20 minutes by default. NOTE: Any Un-Saved data will be loast. Q: Can more than one user be logged on at one time? A: (YES) Currently Statewide Reports will allow 50 users to be logged on at one given time. This will not effect the performance of the application and access to your data. Q: Do I need a special program to run the Web App? A: (NO) You do not need any special program to use the Web App. It is designed to run on your default Web Browser. The Web Application does not run on the Client Machine (Your Computer). The application runs on the Statewide Reports Domain Controller which is protected by multiple security levels and is deticated to the web services. Q: Can I download all the data and the program to run on my machine? A: (NO) The PDC (Primary Domain Controller) will not allow you to download the data files or the program. The Web App requires an IT specialist to setup execution and access with the IIS (Internet Information Server). These file are not only invisible to the public but can not be access through the internet even with Administration Rights. Security is very important to Statewide and it's Clients. Q: How secure is the data posted? A: Other then the Security Levels with the PDC, IIS and Firewalls, the Web Application has CODED BUILT-IN Security to insure only you can get your data. It is impossible to view any of the data without using the Web Application. Q: Can I submit a NEW REQUEST from the Web Application? A: Yes you can. Statewide Reports Invites you to use their automated system online to submit your requests. As a Client, you simply click on the link "SUBMIT REQUEST/S" and a empty list will appear for you. If you already have Request that you have entered and have not submitted yet, they will still be in the list for you and will stay there until you Submit them or Delete them. To enter a NEW Record, you press the "INSERT NEW" button and enter your information. Once you have finished and Save your data, you will be returned to your list of requests. You may enter as many as you wish at any given time. When you have entered all of your Requests that you would like to submit, you may press either the "SUBMIT THE SELECTED REQUEST" which will only submit the request you have selected or you may press the "SUBMIT ALL REQUESTS" which will submit ALL of the requests in your list together. In either case a Warning will appear reminding you that you should PRINT or DOWNLOAD a copy of your Request for your own records if you wish too. Once these request are submitted, they are removed from the Web Database. Q: When I start the Web App, Why do I not have my normal menu bar, etc...? A: The web application should be treated like any another local program on your computer. The menu bar and tool bars do not control the web applications navigation, only the links and buttons on the web app will navigate you through the program and give you the results you are looking for therefore, by default, the menu bar and tool bar will not be displayed for you. Keep in mind that like any program, when you use the "X" on the system menu, you are closing the program. Use the Links and Buttons to logoff and close the program. You can use the "X" button offered on the displayed window but you should not use the "X" on the most upper right hand corner of the screen. Q: How does the Web Application Execute? A: The Statewide Reports Web Application is an Executable that is launched by IIS and runs on the Statewide Reports PDC Server. For every user logged on, a separate instance of the Executable is created and runs on the PDC. Currently, 50 users may be logged on at the same time. The Executable reads the request submitted by the user through the browser and then creates the results in HTML format for the user to view. All Queries are processed on the PDC Server by the Executable locally. The HTML source code generated is viewable from the browser with the "VIEW SOURCE" option and can be copied to another browser, however the HTML code will NOT execute the copy or query in another instance that was not launched by IIS. If the browser is closed, the instance is removed and cannot be accessed again. Only another launch by IIS can be established. The HTML Code is comprised of TS, IC and JAVA Scripts. All the functions and interpretors are access through Custom DLL's running under the PDC Server and IIS. This lowers the Server overhead as well as increases the efficiency of the application by keeping the Executable file small. The Data can only be accessed through the Program and can not be viewed any other way. The Data IS NOT Posted on a Public Internet Site but resides on the Statewide Reports PDC and is accessed through their local network and a custom program developed as well. The system developed is designed to run this way only and will not on a Public Internet Site. Q: What are the Network and Client Requirements? A: Clients must have an Internet connection, a Web Browser with Java Script loaded and enabled and must have "Allow Third Party Extensions" enabled in the Internet option preferences. Clients must also have a PDF Reader 4.0 or greater which is the default for data requested postings. The web Application is best viewed with I.E. 4.0 or greater and with a 800 x 600 screen resolutions at minimum. The Statewide Web Application will work in third party browsers. The Web application is only availible through a SSL connection. Q: What are the Security Levels to access the data? A: User Access through a PDC Controller, IIS with Firewalls and Up-To-Date Security Patches in place as well as BUILT-IN Security coded in the Web Application. Q: What database is being used? A: The Web Application is designed to use the most popular engines available. Currently, Statewide Reports is using the ENCRYPTED TOPSPEED Database engine developed by Clarion ( now Soft Velocity).